The Governor General Lt Gen The Rt Hon Sir Jerry Mateparae, recently hosted an afternoon tea at Government House in Wellington to recognise living donors and acknowledge the gift they have given. 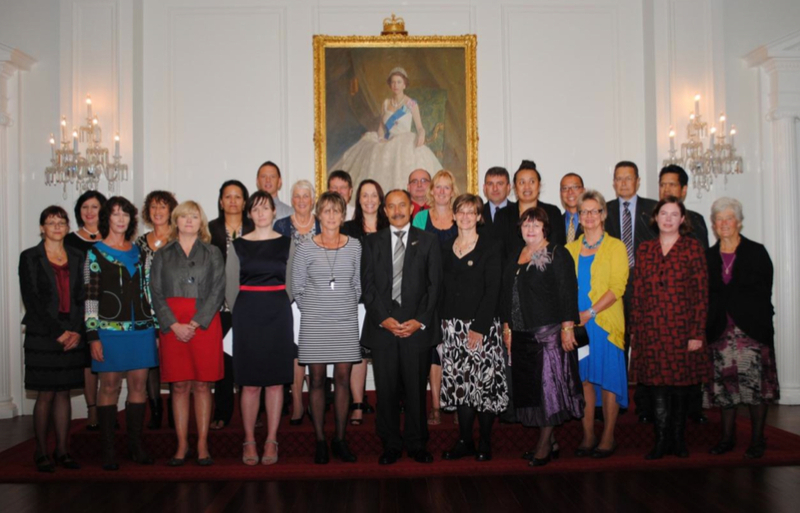 The Governor General is pictured here with the living donors who attended the function. The donors were presented with a certificate by the Governor General. Dave Henderson, Chairperson of Kidney Health New Zealand, exerts from his speech, given at Government House to recognise living donors. In the drama that hits the headlines when a well-known person donates or receives an organ, it is often overlooked that an increasing number of New Zealanders are in need of a kidney, and alongside this is the increasing number of New Zealanders who are choosing to donate one. It may be to a family member that people donate, or may be to a complete stranger, but this is a wonderful thing to do, and it helps not just one individual recipient but all their family and whanau. It is well recognised that kidney disease affects not just one person, but all their family. There are huge effects- it can undermine one’s ability to work and earn income, to play sport, to pursue hobbies, to take the kids on holiday or to go as parent support on a school camp. Ultimately, it can shorten ones life. But receipt of a donated kidney can change all that – it is a huge gift that people here have been able, and have chosen, to give, and it certainly should be celebrated. All this has great personal significance for me – as the recipient of a kidney almost three years ago my life has completely changed, from working just 15 hours a week to now more than full-time, I’m able to be fully involved in my family, and I can really enjoy it because I have so much energy and so much appreciation for life. It’s funny in a way, after being increasingly ill throughout my 50’s, to now find myself in my 60’s fitter and healthier than I have been in a long, long time. This is what the gift of a kidney has meant for me. As Chair of Kidney Health New Zealand, I’d particularly acknowledge your service, Your excellency, as patron of our organisation. We are humbled but also inspired that you have chosen to support the work we do. Increasing the frequency of kidney donation is of course a significant goal in our strategic plan, and to that end we are active in the National Renal Advisory Board, which advises the Minister, the Ministry and the District Health Boards. We are ably represented by our Medical Director Kelvin Lynn and we also nominated consumer representative Michael Papesch to that Board. We also work directly with the Ministry of Health, developing information resources that are made available nationally for renal patients, family and whanau. This includes information on donation generally along with answering such questions as Who can donate, what tests are invloved, the opportunity for donation to a relative or family member, and the financial support that is available. So the future is looking bright for continuing donation and transplantation of kidneys in New Zealand. Today however, we are here to celebrate donations that have already taken place.